develop novel outcome measures to assess active RA, response to therapy, and flare potential. To this end, we developed high resolution (105µm) in vivo contrast enhanced (CE)MRI of murine arthritis with in vivo CT, which permits longitudinal quantitation of synovial volume, erosion volume and popliteal lymph node (PLN) volume. Contrast Enhanced MRI scans of the knee of a patient with inflammatory psoriatic arthritis before (left) and after (right) anti-TNF therapy shows the drug effects on bone marrow edema. 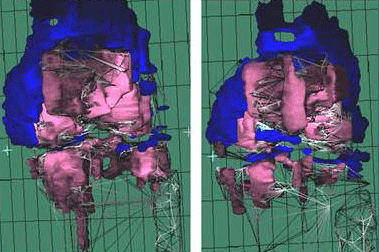 3D reconstructed images of the edema signals differentiate the synovial fluid (blue) and the pathologic bone marrow edema (red) as described in (Anandarajah et al., 2008). Lymphatic flow into collapsed PLN of TNF-Tg mice is significantly reduced vs. that of expanded PLN in the contralateral leg, which correlates with inflammatory-erosive arthritis. B-cell depletion in a collapsed PLN restores its function and ameliorates arthritis. Disruption of CXCL13 signaling prevents the collapse of expanding PLN and arthritis. And, these expanding and collapsed PLN also exist in patients with RA and can be studied via CE-MRI and Doppler ultrasound. Focal erosions in RA, which leads to irreversible structural damage, deformities and loss of function, are known to be mediated by inflammation-induced osteoclasts, which are multinucleated cells that are responsible for bone resorption. Interestingly, patients with both RA-like disease and systemic lupus erythematosus (SLE), have a non-erosive form of inflammatory arthritis called Jaccoud's arthritis (JA). Recently, we have shown that the mechanism for this non-erosive JA is medicated through lupus-induced interferon-alpha (IFNa), which inhibits osteoclast formation at the cell fusion step. Since the dendritic cell specific transmembrane protein (DC-STAMP) is known to mediate osteoclast precursor fusion during osteoclast formation, and we have recently shown that DC-STAMP is regulated by this process, we are currently investing its signal transduction mechanism and its potential as a biomarker of erosive disease. 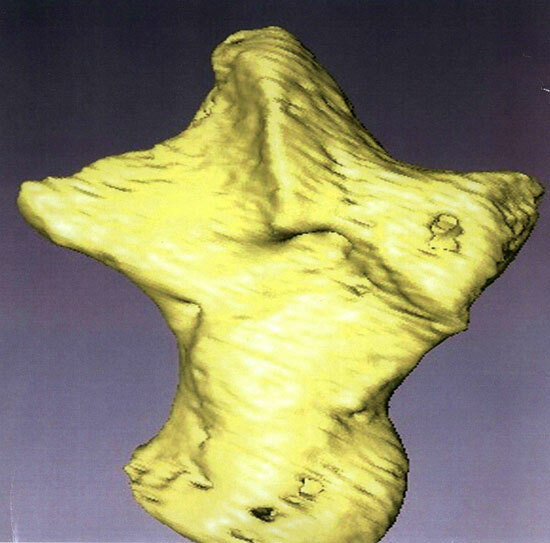 3D reconstructed image of the ankle bone of a mouse with erosive arthritis as described in (Mensah et al., 2010). One of the greatest mysteries of arthritis, and the greatest clinical concern in treating the disease, is the source of joint pain. The greatest obstacle towards understanding joint pain is the absence of an objective-quantitative outcome measure that can be used in animals and people. Bone marrow edema signals observed on CE-MRI have been studies in RA, osteoarthritis (OA) and various spondyloarthropathies (SpA). To explore this further in murine models of RA, OAand degenerative disk disease (DDD), we have developed custom surface coils that interface with a clinical 3T MRI that allows us to perform natural history and therapeutic intervention studies.